As a self-publishing author, it’s next to impossible to manage all aspects of publishing a book by yourself. Inevitably, you’ll need to seek help with at least some stages of the process. And there’s a bevy of providers out there, eager to offer their assistance. Porter Anderson observed last month on the FutureBook blog that “the complexity exploding around decisions facing authors today … is boggling.” And in a recent podcast, Joanna Penn again warns authors to “do their due diligence” when seeking help with self-publishing. These comments are as true for editing as for any other author service. How can authors know what they’re getting? Bottom line: if you’re paying someone to help you, that transaction must be transparent. You need to know exactly what the editor will do and what it will cost. In short, all the terms must be spelled out plainly. Lately, most authors who contact us are requesting a quote for proofreading. And we could simply provide a quote for proofreading, but that wouldn’t be transparent. Why? Because when we look at the manuscript they’ve sent, it’s clear that the manuscript doesn’t need proofreading—it needs copyediting. 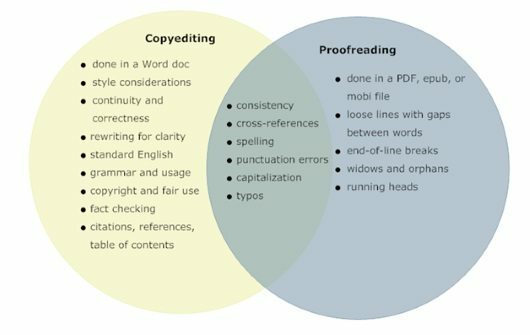 The easiest way to remember the difference between copyediting and proofreading is to consider when they occur in the editing process. Proofreading is the final stage of editing. It occurs after your book has been formatted for print or digital distribution—after you get it back from your formatter or book designer. Proofreading occurs when your book is in its final form—in the environment in which your reader will read it. For print books, proofreading will occur on a PDF. For an ebook, the proofreader will view your book as an epub or mobi file—on a Kindle, perhaps—and keep a list of any changes that need to be made in the master file. Any corrections that the proofreader suggests will need to be addressed by your formatter or designer. If you’re the formatter or designer, you’ll be the one making the corrections. The proofreader will also look for errors that have been introduced during the formatting and design process. That’s right! Every time someone touches your book manuscript for any reason, the possibility of introducing errors exists. So the fewer changes you have to make at the proofreading stage, the better. You also need to consider the kinds of changes that make sense at the proofreading stage. Because formatting or designing a book involves placing and finessing text so that things look and operate correctly, you don’t want to be rewriting or shuffling sentences at the proofreading stage. In the case of print, even inserting a word could cause the words in a sentence to bunch up or spill over to the next line and affect the spacing of a sentence or paragraph. This can upset a carefully planned print layout. Instead, you’ll only want to make the tiniest of changes, so that you don’t disturb the layout of your book. Your proofreader will be looking for language errors and formatting errors —missing words, typos, punctuation errors, spelling and formatting inconsistencies—the smaller things that have slipped through previous stages of editing. The diagram below compares the kinds of things you’d ideally address at the copyediting and proofreading stages. Some of the tasks are addressed at both stages, but it’s less costly to address the overlapping tasks at the copyediting stage. You can view a more detailed list of copyediting tasks at Beyond Paper Editing. When an author submits a manuscript to us for “proofreading,” this is the first question we ask: “Has your book been copyedited?” If it hasn’t, the process can become costly for the author. Here’s why: editors generally copyedit a manuscript using a variety of automated copyediting tools. These tools not only help editors to be more accurate in hunting down errors, they also help them to be more efficient during the copyediting process. If an editor charges by the hour, you will want her to use the tools that will make the process more efficient, as this will be less of a drain on your book budget. Most automated tools only work with Microsoft Word—the editor’s tool of choice. It follows, then, that the bulk of corrections should occur when your book manuscript has not yet been formatted as a PDF, epub, or mobi. Further, copyediting can involve recasting and reordering sentences for clarity, a task you most definitely want to avoid when your book has been formatted or laid out. For more information on what copyediting looks like, see What Does Editing Look Like? Behind the (Crime) Scene at the Editor’s Screen. Of course, if what your book needs is a copyedit, but what you have is a PDF that a designer has already laid out, your editor will do the best she can. Just be prepared to pay more for the job, because your editor may not be able to access the tools that will make the job more affordable. And if she does find a workaround, it may require your designer to make adjustments that will cost you extra. Ideally, a manuscript should go through both the copyediting and proofreading stages. If your book has been copyedited, then of course proofreading will be next. Many self-publishing authors, though, are foregoing copyediting, assuming that the finer details of style and consistency have been seen to by their beta readers. Hence the request for proofreading. We are sorry to tell you that skipping this stage of the process is almost always a mistake. Unless someone—you, a copyeditor, or a skilled beta reader—has systematically combed your manuscript in search of the copyediting items listed in the diagram above, it is likely that it’s still full of errors. And it will be a proofreader’s nightmare, because, remember, the proofreading will be taking place in its final environment, where corrections are time-consuming and costly. Even if your book has already been laid out for print by a designer, proofreaders would like to receive the Word file as well. Indeed, Word allows for so many accurate, time-saving tools that we once intercepted a manuscript we were to proofread, asking the author to please let us have the Word file for a few days before he sent it to his designer. What were we doing with that Word file? Troubleshooting the proofreading process using Word’s powerful tools. Note that this book had already been expertly copyedited. But in our experience, there’s always room to tweak a little more in Word. This is one more reason proofreading should almost always be delayed. If you’ve sent a chapter to an editor for a sample markup, pay close attention to her corrections and comments. Has she flagged mostly typos, punctuation errors and awkward end-of-line hyphenation? Or has she marked incorrect grammar, usage, and unclear writing? Compare the comments to the items in the diagram above to get an idea of what your manuscript needs. If the editor has queried your word choice or rearranged a sentence, you are likely still at the copyediting stage. Especially if this is your first book, by the time you’ve been through writing, revising and rewriting, you may feel confident that your book is ready for proofreading. The truth? It probably isn’t. Writing and preparing a book for publication is a long and laborious endeavour—longer than many want to admit. There’s a risk, always, of rushing the process, thinking the race is over when really, the finish line is only just in your sight line. A perpetual hazard for writers, when it comes to editing, is that so often they don’t know what they don’t know. Understanding the difference between these two final stages of editing will save you money and grief in the long run. I didn’t realize that some copyeditors were using automated tools. The editor I use doesn’t. I always use Grammarly for my blog posts and my guest posts and I wouldn’t post anything online without first putting it through that final grammar check. I can’t help but wonder if some authors are using Grammarly in place of a copyeditor. While Grammarly is a wonderful app, it doesn’t catch everything. I would think the same would be true for copyeditors who use automated tools. Or am I wrong here? Great questions! Tools cannot replace everything that a proofreader or copyeditor can do, but they can make aspects of the editing and proofreading process more accurate and efficient. If you’re paying a proofreader by the hour, efficiency may matter to you! For example: one of my favourite proofreading tools can check that you have closed up all quotation marks and brackets. Can you imagine checking a 300-page book for every closing quotation mark and bracket? Proofreaders check for these kinds of details! But why check for these things manually when you can address them reliably and efficiently with a tool? Using tools frees up the proofreader to address tasks that cannot be automated. When Carla and I copyedit and proofread, we use tools in addition to a careful read-through of a document. I think that’s good practice. Yeah, that’s frightening. Thanks for sharing. I kinda blame the confusion on grade school. Our teachers always said to proofread our work prior to turning it in for a grade without really telling us that what we turn in is the proof. My brother, who has had several hats in the publishing industry during his adult life, once explained it to me like this: Three wishes from a genie. The first wish: the Novel, as prepared as it can be with all the tools at the authors disposal. Have the decency to run spell check prior to sending it to the editor. Any editor. Any reader. Second wish: Copy editing. As in. Editing of the Copy. The copy being what is written by the author. The editor is preparing such text for layout, so complications in the style and flow, along with consistency should be made at this point if not before. Rinse and repeat as necessary, then send to layout. Third wish: Proofreading. As in. Reading of the proof. The proof is basically the finished product holding only for final approval. The idea is to catch last minute errors, errors either the author or the many layers of editors missed, to catch the widows and orphans and rivers, that kind of thing. Once a proof is approved, the genie is out of the bag and into the world. Simplistic perhaps, but it helped me out when I wrote and self-pubbed my first novel. In one regard, though, teachers are not wrong: You can, and should, self-edit your work—polish it as much as you can on your own. Resist handing your writing to beta readers or editors without doing this step first. You have captured correctly how things work in the publishing industry. This is the process publishers use to create the best possible book. What do you think self-pubs can learn from this process? Are there some places where they might tweak or deviate from the process and still create a quality book? Ah, skipping any of the process is risky, but I think most would agree that the copy phase and the proof phase are critical to the success of the work. Some authors are really adept at self-editing their own work, others aren’t. Here is where it should be said that it’s good to know your limitations. If you’re going to do the edits yourself, I’d suggest printing the manuscript and do at least one pass through starting at the last paragraph and working backwards. You catch so much more in a physical document than you do a digital one and working backwards helps to separate the emotion from the critical eye so you can see more of what’s missing. It never hurts to arm yourself with knowledge, and you should never ever think there isn’t more to learn. It surprised me how much I didn’t know I didn’t know, and I had brotherly help! I think keeping track of blogs like this one, and networking with trustworthy experts (they can be friends too, but you’re looking for the expert here and not the friend) can make the journey less painful in both the pride and the pocketbook. That’s a great distinction between proofreading and self-editing. Very helpful. Yes, there is much confusion around what constitutes copyediting vs proofreading, and much misinformation, too. I agree about the overlap in copyediting tasks—frequently, time and budget don’t allow a copyeditor to do all the fact checking they’d like. I think the author and copyeditor need to iron out the scope of fact checking well beforehand. And in fiction, copyeditors will sometimes stet grammar if the error occurs in dialogue. I learned how sensitive the text is to changes from a typesetter at a university press. When I’d request changes late in the game, she’d remind me to keep to the same number of keystrokes whenever possible. Makes so much sense. Print is a lot of work, isn’t it? I laughed at your typesetter’s insistence on the same number of keystrokes if you change something! Rough crowd! I’m not quite that hard to please, but this is why I always charge by the hour. The times I’ve tried to quote per-project rates, I invariably end up with an author who changes things constantly, right up until the very end, completely unaware of the time involved when something’s already in layout form. Actually, we only got down to counting keystrokes when I asked for more changes at the 11th hour. But I learned to appreciate the process that way, that’s for sure. And it’s true—last minute changes are costly, and charging by the hour can help to control that. I had a designer tell me the same thing once. He quoted a ball park figure for a job, but added that if the client kept coming back with “just one more thing,” he’d have to charge by the hour. Thanks again for your valuable perspective on this! Great article! I’ve been a proofreader since the late ’80s, and I appreciate this clear, concise explanation. I’ll be bookmarking this link to give to potential clients who don’t quite understand what I do (thinking I am a big-picture developmental editor too). Sadly, I must say that there is often a lot of overlap of my skill set into the copyediting circle. Too many copyeditors (in my opinion) miss a lot of fact checking and grammar errors. I’ve had to flag a lot of these sorts of things over the years—so many that I now assume these are part of my job description. And I’ve caught some DOOZIES along the way! A good proofreader looks at her document and always thinks, “There ARE mistakes here. Find them. Question everything.” I flag more items than I need to, if only to let the author make the final decision on a specific fact or wording issue. Call it to the author’s attention, but let him make the choice. Because I am also a book interior typesetter, I especially appreciate your pointing out that any big changes in layout will mean more than a few keystrokes to the typesetter. I often spend a lot of time copy-fitting text in a print layout with kerning, hyphenation control, and leading. To have an author rewrite even a single phrase can upset a carefully controlled balance of text in a print layout. Thanks for your comments, Linda, and for a view into the proofreader’s (and interior designer’s) world. Just curious… have you ever proofread a book that wasn’t copyedited? If so, what was that experience like for you? If not, why not? I have often proofed both manuscripts and layouts that haven’t been through much editing, let alone copyediting. In these days of self-publishing, it happens all too often, I’m afraid. A lot of how that experience pans out is based on the author. I have a few authors I love working with — several are indie and several are trad pub — because they are sticklers about their own work and they consistently hand me amazingly clean copy to work with. One even uses nothing more than some beta readers (though good ones) and no other copyediting. I’m always happy to work with him because his stuff is in good shape. He knows his craft as a writer … and he knows that it includes knowing grammar and style issues. I usually will work only once with an author whose work hasn’t been properly copyedited and who doesn’t feel it’s his job to know grammar and punctuation. I find that viewpoint arrogant. It’s like hearing a carpenter say he wants to build a beautiful rocking chair … but he can’t be bothered to learn how to use a hammer or saw. The tools of the trade are words. If you’re good with the details of words, then fine. If you’re not, get proper help ALL along the route: editing, copyediting, proofreading. Different jobs. Different stages. So it’s easiest for a proofreader to a good job if he or she has a clean copy to work from. You raise an interesting point: How you get your clean copy can vary: beta readers, setting your manuscript aside so you see things objectively (we recommend a month, at least), learning some copyediting skills on your own, or even hiring a copyeditor. I even think a partial copyedit is very helpful if you want to begin to learn how to sharpen your copyediting skills. A partial copyedit will show you your quirks in your writing, and you can then use that information to help you fix your manuscript with those quirks in mind.